As video consumption increases in tandem with Internet bandwidths across the world, our appetite for immersive video is also going up. However, creating and editing 360-degree video has been anything but easy. Though there have been quite a few products that let you create 360-degree video like the Ricoh Theta and the Samsung Gear 360, the processing of this video has always been painful. GoPro hopes to change this with its new Fusion 360-degree camera. The GoPro Fusion has a slightly unconventional design for a 360-degree camera and certainly for something coming out of the GoPro stable. The the fish-eye lens on both ends gives away the fact that this is a camera with a wider world view and the flaps and buttons on the sides are classic GoPro. There is a small LCD screen on the front for you to see the mode and some other details. The record button is just below. It’s shape is more flatter than a regular GoPro, but that shouldn’t deter you from attaching one on top of your helmet. In the box is a stick that easily converts into a monopod and is one of the best camera accessories I have seen in a while. The GoPro Fusion is easy to set up and connects to the GoPro app. You can control it from the device or via the app — I will go for the second option always. The connection is a mix of Bluetooth and Wifi and depending on what you are doing, you will need to use both. The app lets you shuffle between different modes like video, photos, burst and timelapse. You can do the same on the device too. One thing you need to keep in mind is that unit does not switch on until you have cards in the both slots — Class 10 cards with at least 32GB storage are recommended. he GoPro Fusion has a slightly unconventional design for a 360-degree camera and certainly for something coming out of the GoPro stable. Once the connections are in place, you can see the 360-degree video from the camera on your phone. However, since the camera is shooting in 5.2K, which even the iPhone X can’t support, you see a scaled down version on the phone. I was initially worried by this, then realised that the actual footage is of a much superior quality. While the phone gives you a good idea of what is being shot, I gradually realised that it was to let this be as you get too caught in peering into the phone screen. It is best to let the GoPro shoot and since it is 360-degree video there is not need to bother about the frames.The video quality is good and is supported by really high-end audio. And this is a superb selfie camera for those who love to see themselves. However, in the 360 video, if you are not careful the stitch does appear at odd places. So it is better to keep the sides towards the horizon where the stich can merge in the blue sky or other neutral surroundings. Once the connections are in place, you can see the 360-degree video from the camera on your phone. And this is where GoPro Fusion is really making an impact. The GoPro app now has an OverCapture feature that lets you cut out any 1080p frame from the 360-degree footage as a separate file. You can even snip out photos. The app even lets you edit the 360-degree video, moving from one part of the frame to another, all on the phone itself. Editing 360-degree video has never been this easy. However, it was a bit tricky posting the videos and photos to my Facebook. The upload process would time out when I tried from the app. I managed YouTube upload in one go though. Also, when you save the 360-degree media to the phone, it does not show up for uploads. So sharing is limited to the app. Photos cropped out of the 360, however, show up in the GoPro folder. The best option otherwise is to just copy the files from your card for editing and sharing. 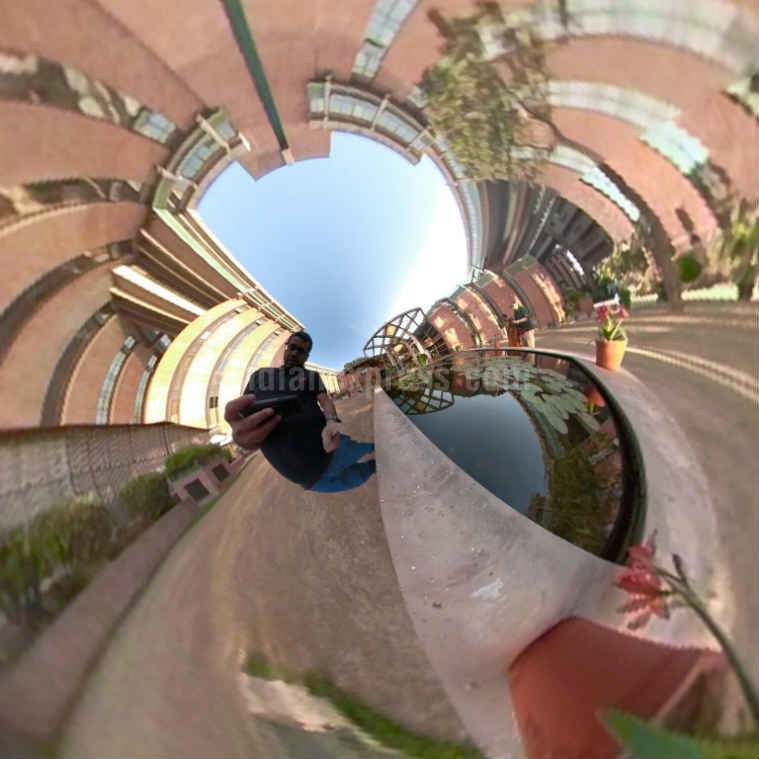 However, in the 360 video, if you are not careful the stitch does appear at odd places. The battery can last about an hour of 360-video recording, which is good. The device does heat up a bit at times. Also, this is waterproof and you can take it for a swim with the sharks. However, there is not much scope for that in a place like Delhi. I did take the Fusion near the backwaters in Kochi, but he water was too murky to be of any use.